Citation Information: J Clin Invest. 2006;116(3):642-651. https://doi.org/10.1172/JCI25705. Previously we observed that neural cell adhesion molecule (NCAM) deficiency in β tumor cells facilitates metastasis into distant organs and local lymph nodes. Here, we show that NCAM-deficient β cell tumors grew leaky blood vessels with perturbed pericyte-endothelial cell-cell interactions and deficient perivascular deposition of ECM components. Conversely, tumor cell expression of NCAM in a fibrosarcoma model (T241) improved pericyte recruitment and increased perivascular deposition of ECM molecules. Together, these findings suggest that NCAM may limit tumor cell metastasis by stabilizing the microvessel wall. To directly address whether pericyte dysfunction increases the metastatic potential of solid tumors, we studied β cell tumorigenesis in primary pericyte-deficient Pdgfbret/ret mice. This resulted in β tumor cell metastases in distant organs and local lymph nodes, demonstrating a role for pericytes in limiting tumor cell metastasis. These data support a new model for how tumor cells trigger metastasis by perturbing pericyte-endothelial cell-cell interactions. NCAM deficiency induces increased tumor blood vessel leakage during β tumor cell progression. 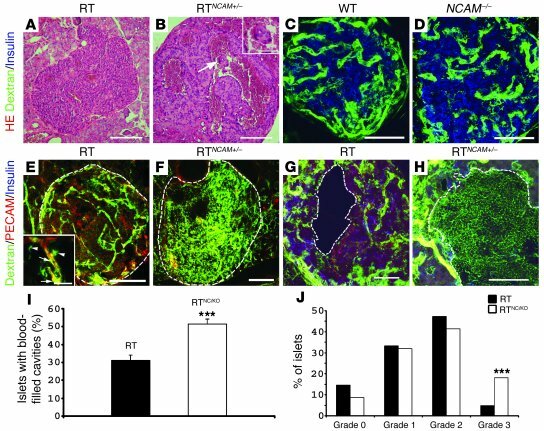 Pancreas sections from 8-week-old RT (A) and RTNCAM+/– mice (B) were stained with H&E. (B) Isolated cell clusters were specifically found inside blood-filled cavities within RTNC/KO islets (arrow). Inset in B shows a higher magnification of the isolated cell cluster. (C–H) Pancreas sections of mice perfused with FITC-dextran (green) were double-immunostained with antibodies against PECAM (red) and insulin (blue). (C and D) Islets from WT (C) and NCAM–/– (D) mice. (E–H) Angiogenic islets from 8-week-old RT (E and G) and RTNCAM+/– (F and H) mice. The islet area is indicated by dashed lines, and extravascular and intravascular FITC-dextran is indicated by arrowheads and arrows, respectively, in inset in E. Dashed lines in G and H mark blood-filled cavities. FITC-dextran specifically leaked into RTNC/KO blood-filled cavities (H). (I) The percentage of islets containing blood-filled cavities was higher in RTNC/KO (n = 292) compared with RT (n = 313) mice at 8 weeks of age (χ2 test, ***P < 0.001). Average values ± SEM are shown. (J) Distribution of RT (n = 144) and RTNC/KO (n = 149) islets at 8 weeks of age according to their vessel leakage (grades 0–3, where grade 3 includes islets with most extensive leakage). The percentage of grade 3 islets was significantly higher in RTNC/KO compared with RT mice (χ2 test, ***P < 0.001). Scale bars: 200 μm (A and B), 50 μm (C, D, G, H, and inset in B), 100 μm (E and F), and 25 μm (inset in E).